John McRae,November 30, 1872 - January 28, 1918, was born in Guelph, Ontario, to parents David and Janet McRae. While other cities and towns have a Civic Holiday or Simcoe Day, the people of Guelph celebrate John McRae Day to honour their favourite son. Young McRae became a bugler in the Highland Cadet Corps at Guelph Collegiate Institute and later became a gunner in his father's militia unit in response to the Fenian raids from the United States in 1866. His academic talents led him to study at the University of Toronto on a scholarship at the age of 16. While there, he lost his sweetheart, nineteen-year-old Alice, to typhoid fever. McRae never married. He studied pathology at McGill University and enlisted as a Lieutenant during the Boer War. Returning to Montreal in 1901, he worked as a resident pathologist at Montreal General Hospital and co-authored a textbook. In 1914, he was appointed surgeon to the first Brigade, Canadian Corps Artillery, with the rank of Major as second in command, and sailed from his base in England to France in the spring of 1915. Shortly thereafter he was on the French line in Belgium. As he sat exhausted near his field dressing station twelve days later under steady bombardment from the Germans, he reflected upon the death of his good friend, Lieutenant Alexis Helmer of Ottawa, on the previous day. It was a sunny morning as he sat at his outpost on a road paralleling the canal leading to Ypres. He listened to the larks singing amidst the sound of the artillery. He saw the rows of crosses in a nearby cemetery in a field which was thick with scarlet poppies. The date was May 3, 1915. 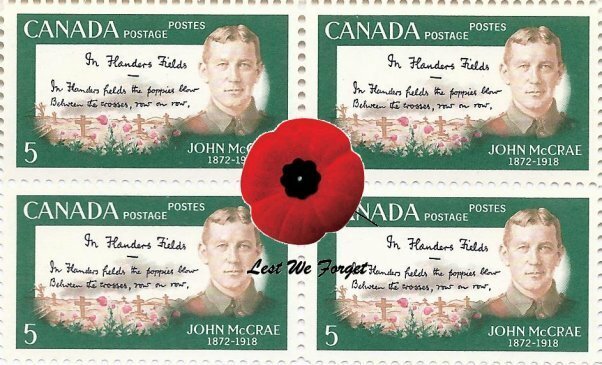 John McCrae wrote the fifteen line poem, In Flanders Field. His poem was turned down a few times before it was finally published for the first time in Britain's satirical magazine, Punch. 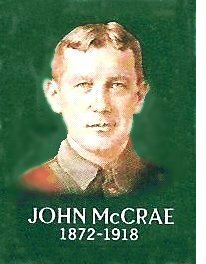 On January 24, 1918, McRae was appointed consulting physician to the British Armies in France, the first Canadian to achieve that rank. Four days later he died of double pneumonia and meningitis while still suffering from the poison gas used by the enemy. He was buried on the following day, January 28, 1918, with full military honours in Wimereaux Cemetery, France; one hundred nursing sisters stood in line during the ceremony. Back home in Canada, newspapers across the country paid tribute to this Pathologist, Poet, Soldier, Physician, and man among men.